Advances in chemotherapy options have led to significantly increased survival rates in reproductive-aged women with cancer. Among the many concerns of young female cancer patients is whether they will be able to conceive and deliver a healthy baby once their cancer treatments are complete. Fortunately, there are a number of fertility preservation options available for women facing chemotherapy, surgery, bone marrow transplantation, and pelvic radiation. All of these cancer treatments have been associated with irreversible loss of oocytes and ovarian function. Fertility preservation options range from medical and surgical treatments to oocyte or embryo cryopreservation using established in vitro fertilization techniques. 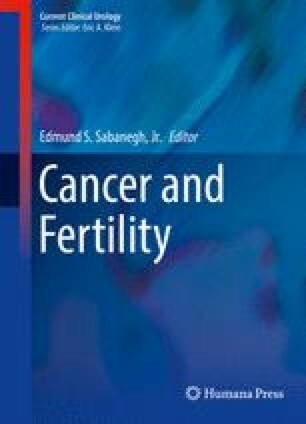 Experimental modalities such as ovarian tissue freezing and in vitro maturation of immature oocytes are also discussed in this chapter. Standard techniques for in vitro fertilization will be discussed in more detail in a subsequent chapter.